The Eagles' Joe Walsh has announced the formation of VetsAid, his new national non-profit organization to provide support for veterans and their families. Walsh has organized the first concert to benefit VetAid on September 20th at Fairfax, Virginia's 10,000-seat EagleBank Arena. Already confirmed to play are Zac Brown Band, Gary Clark Jr., and Keith Urban -- with more artists still to be announced. According to the press release: "Veterans and their wellbeing have always been important to Walsh, a Gold Star family member himself. His father was a flight instructor for the first US operational jet powered aircraft, the Lockheed F-80 Shooting Star, and died while stationed, and on active duty on Okinawa when Joe was just 20-months-old. "I had to do something and seeing as though rock-and-roll seems to be what I do best, it’s also the least I could do for those who have served and continue to serve our country. We’re all in this together as Americans and seems to me lately that people are forgetting that. I asked my buddies Zac, Gary and Keith to step up and I’m so grateful that they did. Let’s put on a show, raise some money and celebrate our vets. . . and let’s do it every year!" Joe Walsh, who rocked Dodger Stadium with the Eagles this past weekdnd, has never been anything other than honored and proud to be part of the band: "It's an honor and a privilege to be in a band with these guys. It always has been, speaking for me. I haven't really understood it all the time -- a lot of things I haven't understood, but (laughter) at this point, it's a great community. We've been through every trip that a band could go through, and we still have fun when we get together." The Eagles will next perform on July 29th at New York's Citi Field. 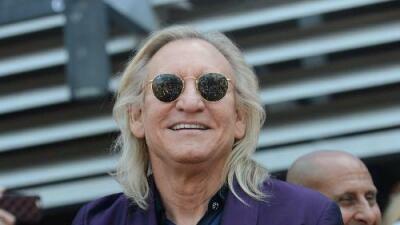 Joe Walsh and his band will return to Las Vegas' House of Blues on September 27th, 29th, and 30th.